Our history of exceptional general surgery residency directors has produced a generation (or two) of extraordinary surgeons. As a resident alumnus, your support is invaluable to our continued success. Whether you trained under Drs. 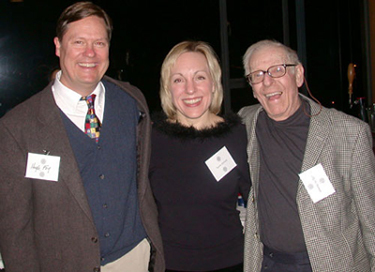 Kaj Johansen, Cliff Herman, Hugh Foy or Karen Horvath, you remember the intense satisfaction of learning how to save and improve lives amidst the camaraderie of your fellow classmates. Your philanthropic support will help future generations of surgeons experience that same fulfillment. We have identified three ways in which you can help us advance our status as one of the top surgical residency training departments in the nation. You can target your gift directly to the fund of your choice or, if you prefer, split it between two or more areas. Of most help to us are gifts to the Chairman’s Discretionary Account (SURDIS 64-1165) because they are unrestricted and allow us the latitude to apply them where they are most needed. The Howie Surgery Research Fund (HOWIES 63-6295) supports the investigative efforts of our junior faculty as seed funding for new research endeavors, thus laying the groundwork to obtain future funding. Gifts to the Surgery Resident Education Fund (HARKFD 65-2872) benefit all our residents by providing enhanced training opportunities as well as loupes, books and resident research. Please consider supporting tomorrow’s surgeons by making a donation today. Gifts can be made in a variety of forms including cash, securities, and real estate, or through planned giving options. You can make a single secure online donation, or, if you prefer, make convenient quarterly installments. Alternatively, you can write a check payable to the UW Medicine Advancement. Write (SURDIS 64-1165), (HOWIES 63-6295), or (HARKFD 65-2872) in the memo line and mail it to: UW Medicineuw Advancement Box 358045 Seattle, Washington 98195 or donate online here. If you have any questions or would like more information on how you can help, please call 206-543-3680. A gift from you helps form the training of your future colleagues. Your commitment to UW Medicine and our department is deeply appreciated.